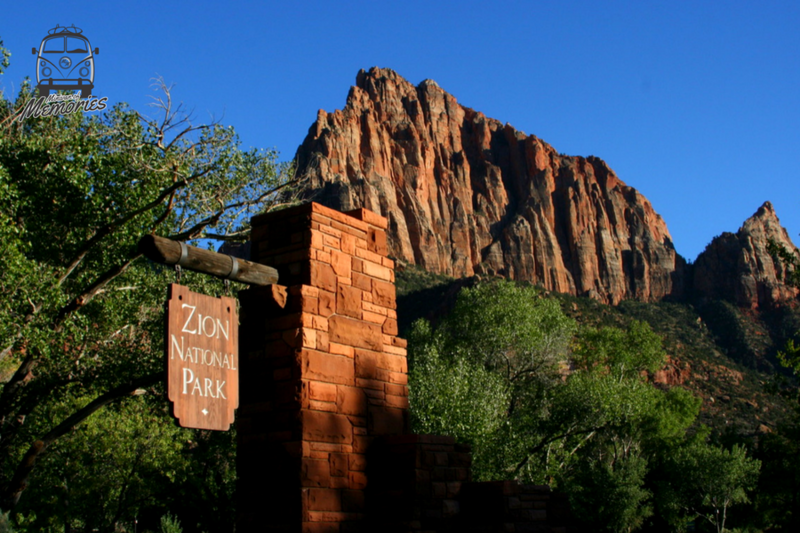 Leaving the city life to pursue our passion of the great outdoors, my husband and I bought our home on wheels and took off to visit the 59 National Parks of the U.S. Zion National Park was on the top of our list, playground for the outdoor adventurist. Arriving to the park we were greeted by its rustic sign and massive beautiful rock landscape. The park is massive with many points of interest, so we decided to go hiking Angels Landing and walking through the Virgin River in The Narrows. That sounded like the perfect adventure for us. Starting our journey off with Angels Landing a 5 mile round-trip challenge with 21 switchbacks hiking up to a 5,790 ft elevation. It was an easy hike starting from Grotto Trailhead, walking a paved trail and switchbacks through beautiful and shaded landscape. The views were amazing and we knew they would only get better! Here’s a video of Stephan going up the switchbacks they call Walter’s Wiggles. The last 0.5 miles of the trail was a strategic climb up a narrow ridge with sheer cliffs on either side. Chains bolted onto the sandstone keep you from falling off the side of the mountain, making it both thrilling and terrifying. My husband trekked up it like a champ but I had a moment of almost wanting to turn back. I'm happy we continued because when you reach the summit, the views are spectacular. Walking through the river of The Narrows was also remarkable. This gorge where the river runs through the narrowest parts of the Zion Canyon is something to experience. It’s amazing! We walked through moving and rocky water for 8 miles with the canyon scaling thousands of feet above us. The water was absolutely freezing, but the experience was one of kind. What draws us to adventures like this is definitely the love we have for the outdoor . To be surrounded by nature, incredible landscape and to conquer rivers and mountains is an overwhelming feeling. The Narrows and Angels Landing are something we’ll never forget. This feeling of thrill and exciting only adventurist outdoorsy people like us get to really experience. There are so many beautiful places in the states and we look forward to many more memories on the road trip of our lives. This memory belongs to our Passenger 8 Paws 1 Tail (@8paws1tail) . All the pictures belong to Gabi, Stephen and Kali's personal archive. To know more about our Passenger 8 Paws 1 Tail, click here.